Software bad-smells, also called design anomalies, refer to design situations that may adversely affect the maintenance of software. Bad-smells are unlikely to cause failures directly, but may do it indirectly. In general, they make a system difficult to change, which may in turn introduce bugs. Although these bad practices are sometimes unavoidable, they should be in general fixed by the development teams and removed from their code base as early as possible. 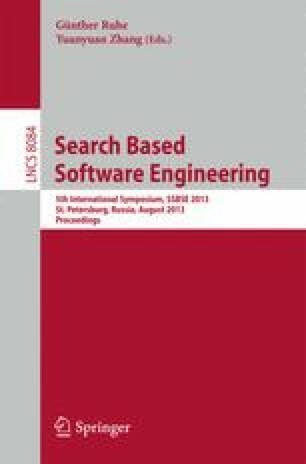 In this paper, we propose, for the first time, the use of competitive coevolutionary search to the code-smells detection problem. We believe that such approach to code-smells detection is attractive because it allows combining the generation of code-smell examples with the production of detection rules based on quality metrics. The main idea is to evolve two populations simutaneously where the first one generates a set of detection rules (combination of quality metrics) that maximizes the coverage of a base of code-smell examples and the second one maximizes the number of generated “artificial” code-smells that are not covered by solutions (detection rules) of the first population. The statistical analysis of the obtained results shows that our proposed approach is promising when compared to two single population-based metaheuristics on a variety of benchmarks.